«Sorry, but there are no more tickets for Rangitoto Island, you’ll have to choose another island”, the lady at the ticket counter told us this Sunday morning. A little frustrated, we left the queue. Rangitoto has been on my bucket list for ages and for some reason I haven’t made it on there yet. And it seemed like this wasn’t going to be the day, either. Waiheke Island day trip, here we come! After thinking through our options, we decided to go to Waiheke Island instead. There are far more ferries going to this popular island in the Hauraki Gulf. So we joined the queue again, bought the ferry tickets to Waiheke and joined the next queue. The Fullers Waiheke ferry only takes 35 minutes but seems to bring you to a different world. As we arrive in Matiatia, we pass hills that are bright green, the sea is dark blue and calm and so is the sky. Waiheke’s ferry terminal reminded me of those mini-airports you see on tropical islands. The vibe of the island instantly takes over as you’re switching from stressed city life into a holiday-like-groove. I’m instantly loving it! We first headed to the information desk, where we took all the brochures on walks and wine we could find, grabbed a timetable and jumped on the next bus that was just about to leave. 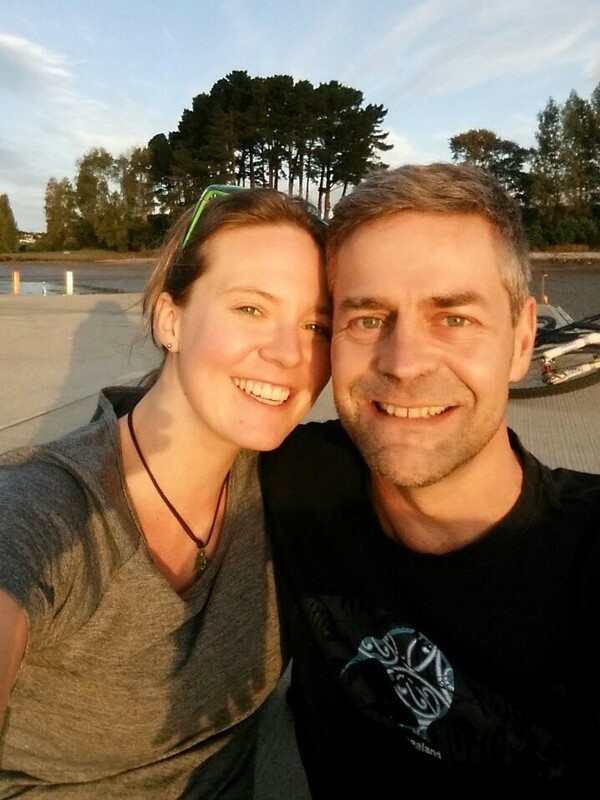 How to get around Waiheke Island? Getting around Waiheke is really easy. You can take your bike on the ferry for free or you can hire bikes (although I don't think biking on Waiheke is such a hot idea), scooters and cars once you’re there. If you want to see Waiheke Island’s wineries and taste some wine, it’s probably best to go by bus. There, you have two options: either you take the Waiheke Explorer bus, a hop-on / hop-off bus with commentary, or you take to local commuter bus. We decided on the last option. Sitting in the bus, we tried to figure out where it was headed. Since we originally didn’t plan to go to Waiheke, I didn’t research like I usually would. We decided to get off in Palm Beach, mostly because the name appealed to us. Turned out it’s a lovely place that has all you look for in a beach: white sand, clear blue water to play around, some rocks to discover the local sea life at low tide and even some name-giving palms. Enjoying the unexpected holiday feeling, we got the maps out to decide where we wanted to go next. A walking path named Te Ara Hura Track spans 100km all around the island, and we decided to walk just a little section of if, from Palm Beach to Onetangi Beach. It looked like there would be a winery along the way, which would be quite welcome for a wine tasting or two. The walk took us from the beach up a hill with amazing views, through farmland, along some lesser travelled roads and fancy houses. No sight of all the people who have been on the packed ferry before. It looks like Waiheke is big enough to accommodate everyone. After a while, the path dropped us on to a street that connects to Onetangi Beach and overlooks a huge area of vineyards. A few hundred meters further down, we see the sign for the Obsidian Winery. We turn and walk down a path. Obsidian Winery Waiheke is small and quiet, and some tables and benches sit under big white sails. We ordered the wine tasting, which meant we were able to try 4 different wines for NZD 10 and because we bought a bottle, those 10$ got deducted again from the price. While sitting and drinking our way through the tasting menu, we discovered people coming from the vineyards. After watching them for a while we asked where they’re coming from and, fancy that, there is an Waiheke Wine Trail that connects Obsidian with six other wineries in the area! We decided to skip the beach and followed the wine trail instead. The best kind of walking trail! Next Waiheke winery on our tour was Casita Miro, a Spanish themed winery. Which was awesome, as I had the feeling of being in Spain since arriving on the island! The winery is on a hill and has an awesome view over the ocean. The tapas in the restaurant looked very español (we didn’t try them, though) and the bar, where the tasting is located, looks just like in Barcelona with its mosaic bar and decorations. To reach the other wineries, we had to walk a little further. Which isn’t such a bad thing as it gives you time to sober up a little bit as you walk past the rich vines and olive trees. The path is extremely beautiful and gives you the feeling of being somewhere in Europe. On the other side of the vineyard walk, there are three more wineries. But because it got quite late already, there was only time for one more. We decided to give Stonyridge Winery a try. The entry to the winery is stunning! We were welcomed by an overgrown house, and the terrace outside the restaurant is beautiful too. It felt very European. On the side they built a very stylish lounge bar with music and loungers. We took our wine glasses and positioned ourselves on a big cushion under the olive trees, overlooking the vineyards. Life is sweet! We would’ve gone and tested some more wineries, but unfortunately, they all close between 4 and 5 pm. Instead, we jumped on the next bus to Oneroa Beach, the main beach, and looked for a nice restaurant there. We found a lovely pub that overlooked the bay and shared a platter, while enjoying the view over the ocean. Having dinner on the island turned out to be a great decision, as we ended up taking the ferry that drove us directly into the sunset! It was absolutely breathtaking to watch as the sun slowly sunk behind Auckland’s skyline and drenched everything in orange and purple. Best ferry ride ever! If you don’t want to take the regular bus to get around the island, there’s an abundance of tours that bring you to the best Waiheke wineries. The tours that are organised by Fullers already include your ferry ticket, while others might be smaller, less touristy tours. All of them have in common that you learn about Waiheke’s unique microclimate and the type of grapes that are grown on the island. And of course you get to taste a lot of wine. Tip: A perfect date is the Twilight Tour which includes dinner at Batch Winery during sunset. Or if you are after luxury, why not fly to Waiheke by helicopter? Zipline Waiheke is a great and thrilling way to experience the island a little different than usual. Two ziplines, both just over 200 metres long, span over a working vineyard. Race your buddy while flying over the vines and enjoy the stunning views all the way to Auckland’s skyline. 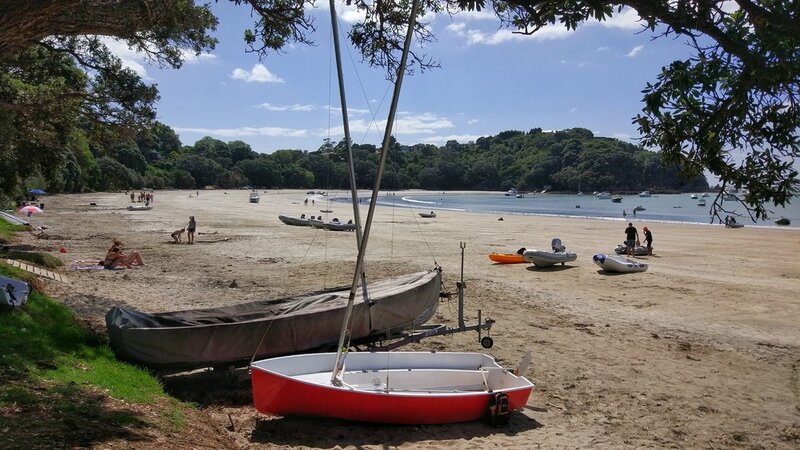 There is simply no way of deciding which is the best beach on Waiheke. They all have their own charm. A favourite with people is Oneroa Beach, which is the main beach close to shops, restaurants and the ferry. It’s long enough for a lovely stroll or a swim in the clear water. I bet camping wasn’t something that came to mind as things to do in Waiheke. In fact, there is only one campground on the island, and it’s quite a basic one. Poukaraka Flats campground is governed by Auckland Council and lies on a thin beach on Rocky Bay. I suggest taking a car when staying here as we were on bikes and the campground is a really long way from any ferry. Apart from the wine and beaches, walking to the Cascades Falls was one of my favourite things to do in Waiheke. This Waiheke walk first leads along the beach, then through Nikau Palms and native forest of the Whakanewha Regional Park. A turn-off leads you to Batch Winery, which makes for a great pit stop. In Matiatia, where Fullers have their ferry terminal, there’s a kayak rental place. It’s hard to miss as it’s right on the beach. Either explore the coastline by yourself or join one of their group tours. The water around the island is calm and perfect to kayak Waiheke! The island lies in the Hauraki Gulf, which means it’s sheltered from the open sea. It has a steadier climate than the mainland and is dryer, similar to the Napa Valley. This makes it perfect for cultivating wine. The average temperature is between 19° and 25° C all year around. Modern apartment hotel, only a 1-minute walk from Onetangi Beach. Some of the rooms boast stunning ocean view! Stunning luxury lodge overlooking Hauraki Gulf. Enjoy free pre-dinner drinks and snacks and a gourmet breakfast each morning. Feel like a celebrity in this amazing hotel! Love what you read? pin it to Pinterest! There are lots of islands in the Hauraki Gulf that make great day trips from Auckland. Tiritiri Matangi Island is a bird sanctuary. For a small amount you can join a bird tour that is operated by volunteers. We learned so much and are now able to name different birds when hiking, which makes it even more enjoyable. In the meanwhile, we did make it to Rangitoto Island, and it was worth the wait. The youngest volcano in Auckland is an enchanting place that let’s you travel back in time and see how the world might have been formed. This post was originally created in March 2018 and last updated in February 2019.